If you’re looking for a particular act in the statutes, try searching for the act name in quotation marks. The quotation marks will narrow down your results to only those that have the act name exactly as you’ve typed it in. 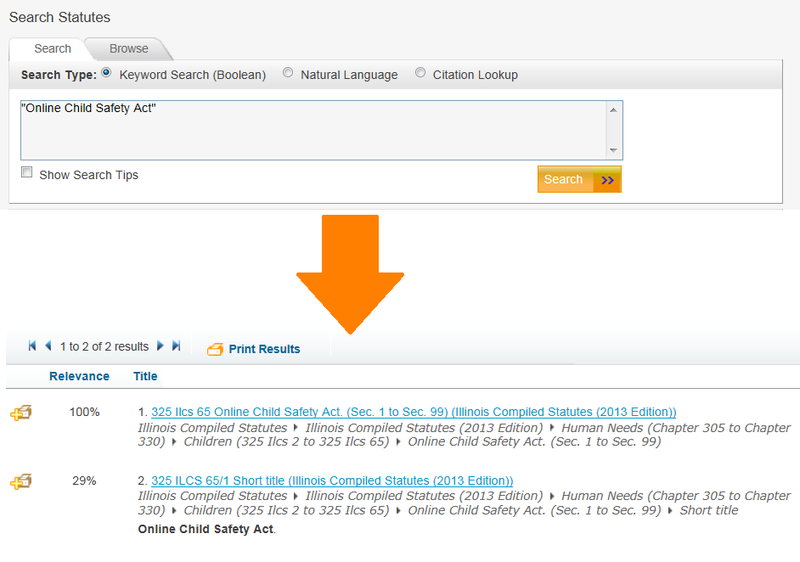 In the example below, we’ve searched for the “Online Child Safety Act” in Illinois. With fewer results to look through, you’ll be able to find the right section in no time! 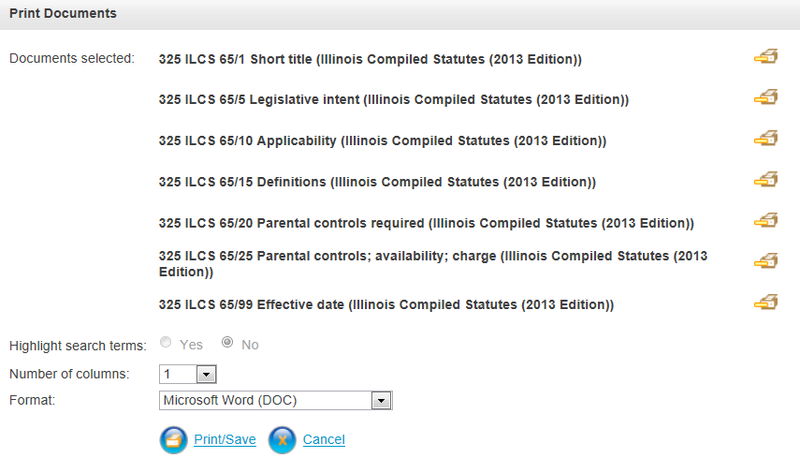 From the Outline View, click on the main group of statutes you want to print. You can get to the outline view one of two ways, either by browsing through the statutes or by going to a statute and then selecting “Outline View” tab in the left frame. In the example below, we’ve chosen to browse through the statutes. We’ve selected 4 Human Needs, then clicked the plus sign next to see it see the chapters contained in it. 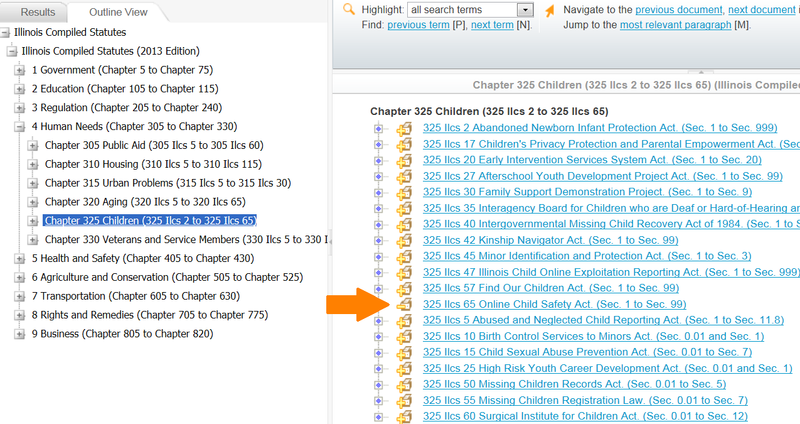 We then clicked on the title – not the plus sign – Chapter 325 Children, to bring up the different sections within the chapter on the right hand side. To add any of the sections to your print queue, just click the printer icon to the left of the individual statute. When the section has been added, the plus sign on the icon will turn into a minus sign. To print the statutes, go back to the black menu bar and select Print, then View Print Queue. All of the individual statutes from the section you added will be in your queue. After you’ve made your formatting selections, click the Print/Save button. The statutes listed in your print queue will begin downloading as a single document on your computer. Open the file using the appropriate program (e.g., MS Word, Adobe Acrobat, WordPerfect) and then print all of the statutes with one click of a button by selecting Print from the File menu.